For this years Mid-Winter antiques auction we are pleased to have been chosen to sell fine furnishings and accessories from a Saugerties, NY Estate. The decedent was a collector, of quality items and amassed his collection over a thirty-year period. Also included are silver and quality smalls from a Summit, NJ home. Two Columbia County historical homes offer an eclectic group of quality items. This sale features American Period, Country, English and Continental Period Furniture, Fine Paintings inc. oils by listed artists, Prints, Black & White Photographs, Sunderland Luster, Early Glass, Early Coin & Sterling Silver, Oriental Rugs, Clocks including a tall case, Mirrors, Country & Formal Accessories, etc. The entry to Glenmere, the restored 1911 Carrere & Hastings mansion that is now a premier luxury retreat in the lower Hudson Valley of New York. Originally designed as a 35-room Tuscan villa for the prominent Goelet family in 1911, the Glenmere in the heart of the Hudson Valley in Chester, New York, has been restored as a luxury hotel by a team of craftsmen overseen by partners/owners DeGraw & Dehaan Architects. Scott Snyder of New York and Palm Beach created the interiors. Original details such as a central open internal courtyard, marbled column porticos, and sweeping interior and exterior staircases remain as a tribute to the mansion's original craftsmanship. Unique furnishings, Italian linens, fine antiques, marble baths with heated floors, and art from a private collection enhance the property's 19 guestrooms and suites, none of which are alike. Many of the accommodations have working fireplaces and terraces with views of the grounds, gardens, and lake on the 150-acre property. The Penthouse offers private elevator access that leads guests to a 2 bedroom/2 bath suite with three fireplaces (including one in the master bath), a large formal living room, dining area, butler's bar, and expansive private terrace. For dining options, guests can take advantage of two outlets: the Supper Room, an intimate dining room filled with a collection of antiques, modern furnishings, and custom-made, handpainted eglomise panels depicting the hills of Tuscany. Meanwhile full bar service and informal meals are available at the Frog's End Tavern. A guide to cultural and recreational goings-on in and around the Hudson Valley. Items for the guide should be sent at least three weeks in advance to westweek@nytimes.com, or by mail to Westchester Calendar, Metropolitan, The New York Times, 620 Eighth Avenue, New York, N.Y. 10018-1405. POUGHKEEPSIE Bardavon Opera House “Garrison Keillor’s a Prairie Home Companion: Live in HD,” simulcast from the Fitzgerald Theater in St. Paul. Thursday at 8 p.m. $15 to $22. Bardavon Opera House, 35 Market Street. (845) 473-2072; bardavon.org. KINGSTON Ulster Performing Arts Center “Goldfinger,” with Sean Connery. Friday at 7:30 p.m. $5. Ulster Performing Arts Center, 601 Broadway. (845) 339-6088; upac.org. MONTROSE Hendrick Hudson Free Library “Julie and Julia,” with Meryl Streep. Feb. 11 at 1:30 p.m. Free. Hendrick Hudson Free Library, 185 Kings Ferry Road. (914) 739-5654;henhudfreelibrary.org. NEW ROCHELLE New Rochelle Public Library “Lifeboat,” directed by Alfred Hitchcock. Tuesday at 7 p.m. Free. New Rochelle Public Library, 1 Library Plaza. (914) 632-7878;nrpl.org. PEEKSKILL Paramount Center for the Arts “The Road,” with Viggo Mortensen. Through Thursday. $7 and $9. “Sabrina,” starring Audrey Hepburn. Wednesday at 7:30 p.m. $7. “Precious,” based on the novel “Push” by Sapphire. Friday through Feb. 11. $7 and $9. “Stage Door,” with Katharine Hepburn and Ginger Rogers. Part of the Classic Film Series. Feb. 10 at 7:30 p.m. $7. “Me and Orson Welles,” directed by Richard Linklater. Feb. 12 through Feb. 14. $7 and $9. Paramount Center for the Arts, 1008 Brown Street. paramountcenter.org; (914) 739-2333. PELHAM The Picture House “Dr. Strangelove,” directed by Stanley Kubrick. Feb. 7 through Feb. 10. $5 and $9.50. The Picture House, 175 Wolfs Lane. (914) 738-3161;thepicturehouse.org. PLEASANTVILLE Jacob Burns Film Center “East of Eden,” starring James Dean. Part of the Elia Kazan Film Series. Through Thursday. $6 to $11. “Herb and Dorothy,” documentary. Part of the “FrameWorks: Art on Film” series. Q&A with Herb and Dorothy Vogel, the subjects of the film, and the director Megumi Sasaki to follow screening. Wednesday at 7:15 p.m. $9 and $14. “Ran,” directed by Akira Kurosawa. Friday through Feb. 11. $6 to $11. “Celebrating Chekhov Film Series,” including screenings of “The Lady With the Dog,” “Ward No. 6,” “A Hunting Accident,” “Uncle Vanya” and others. Feb. 12 through Feb. 25. $6 to $11. Jacob Burns Film Center, 364 Manville Road.burnsfilmcenter.org; (914) 747-5555. SCARSDALE Bendheim Performing Arts Center “The Second Annual ReelAbilities: N.Y. Disabilities Film Festival.” Through Monday. $10. Bendheim Performing Arts Center, 999 Wilmot Road. (914) 472-3300; jccmw.org/reelabilities. BEACON Mount Gulian Historic Site “Mount Gulian’s Children’s Valentine Tea,” with light lunch and dessert. Ages 4 and up. Feb. 6, noon to 2 p.m. $15; children, $12. Mount Gulian Historic Site, 145 Sterling Street. mountgulian.org; (845) 831-8172. MAMARONECK Emelin Theater “If You Give a Pig a Pancake and Other Story Books,” eight mini-musicals presented by TheaterworksUSA. Ages 5 to 10. Tuesday at 9:30 and 11:15 a.m. $7 and $8. Emelin Theater, 153 Library Lane. (914) 698-0098; emelin.org. OSSINING Teatown Lake Reservation “Story Sundays,” stories and activities about nature, animals and ecology. Ages 4 to 7. Jan. 31, 11 a.m. to noon. $5; members, free. Teatown Lake Reservation, 1600 Spring Valley Road. teatown.org; (914) 762-2912. PEEKSKILL Ford Theater “The Ugly Duckling,” a musical adaptation of the story byHans Christian Andersen, followed by “Providence,” a play written by Mehr Mansuri and directed by Leslie Fields Cruz. Presented by The Children’s Theatre Company of Peekskill. Ages 4 and up. Through Feb. 7. $10. Ford Theater, 1031 Elm Street. PLEASANTVILLE Jacob Burns Film Center “20,000 Leagues Under the Sea.” Part of the Movies for Kids (and Their Families) series. Ages 6 and up. Feb. 6 through Feb. 14. $6 to $11. Jacob Burns Film Center, 364 Manville Road. (914) 747-5555; burnsfilmcenter.org. POUGHKEEPSIE Bardavon Opera House “Brothers Grimm’s Rumpelstiltskin,” live performance featuring Matthias Kuchta and life-size textile figures. Ages 3 to 8. Monday and Tuesday at 10 a.m. and noon. $6 and $10. Bardavon Opera House, 35 Market Street. bardavon.org; (845) 473-2072. SCARSDALE Greenburgh Nature Center “Winter Wonderland Puppet Show.” Ages 2 and up. Feb. 13 at 10:30 a.m. $6. Greenburgh Nature Center, 99 Dromore Road. (914) 723-3470; greenburghnaturecenter.org. TARRYTOWN Tarrytown Music Hall Disney’s “Beauty and the Beast Jr.,” presented by the Random Farms Kids’ Theater. Ages 3 and up. Through Feb. 7. $18. Tarrytown Music Hall, 13 Main Street. (877) 840-0457; tarrytownmusichall.org. VALHALLA Academic Arts Theater “Danceworks for Children,” an annual event. Ages 3 and up. Jan. 31 at 3 p.m. $7. Academic Arts Theater, 75 Grasslands Road. (914) 606-6262; sunywcc.edu. WHITE PLAINS Arts Exchange “Peter and the Wolf,” by Segei Prokofiev. Performed by the Nigief Ensemble and presented by ArtsWestchester and the Eastchester Arts Council. Ages 4 and up. Feb. 14, 3 to 4 p.m. $15 and $20. Arts Exchange, 31 Mamaroneck Avenue. (914) 428-4220; westarts.com.WHITE PLAINS The Play Group Theater “13,” musical comedy by Jason Robert Brown. Ages 8 and up. Through Jan. 31. $15. The Play Group Theater, 1 North Broadway. (914) 946-4433; playgroup.org. BEACON Dia:Beacon “Zoe Leonard: You See I Am Here After All, 2008.” Through Sept. 7. “Sol LeWitt: Drawing Series.” Through November. $7 to $10; members and children under 12, free. Fridays through Mondays, 11 a.m. to 4 p.m. Dia:Beacon, 3 Beekman Street.diabeacon.org; (845) 440-0100. BRONXVILLE Bronxville Women’s Club Paintings by Miho Goto. Through Feb. 28. Tuesdays through Fridays, 9 a.m. to 1 p.m.; and by appointment. Bronxville Women’s Club, 135 Midland Avenue. bronxvillewomensclub.org; (914) 337-3252. DOBBS FERRY Upstream Gallery “Small Works,” group show. Through Jan. 31. Thursdays through Sundays, 12:30 to 5:30 p.m. Upstream Gallery, 26 Main Street.upstreamgallery.com; (914) 674-8548. GARRISON Graymoor Spiritual Life Center “International Crèche Exhibit.” Through Jan. 31. Daily, 10 a.m. to 5 p.m. Graymoor Spiritual Life Center, Route 9.atonementfriars.org; (845) 424-2111. HARRISON Harrison Public Library “Trips and Impressions,” photographs by Lev Gogish. Through Feb. 21. Mondays and Wednesdays, 9:30 a.m. to 9 p.m.; Tuesdays, Thursdays, Fridays and Saturdays, 9:30 a.m. to 5:30 p.m.; Sundays, 1 to 5 p.m. Harrison Public Library, 2 Bruce Avenue. (914) 835-0324; harrisonpl.org. HUDSON BCB Art “Selections,” highlights from the 2009 season and previews of upcoming shows. Through Feb. 28. Free. Thursdays through Sundays, noon to 6 p.m.; or by appointment. BCB Art, 116 Warren Street. (518) 828-4539; bcbart.com. KATONAH John Jay Homestead Historic Site “From Oppression to Freedom: John Jay and His Huguenot Heritage,” historical objects and artifacts. Through Oct. 31. $2. Wednesdays through Saturdays, 10 a.m. to 3 p.m.; Sundays, 11 a.m. to 3 p.m. John Jay Homestead Historic Site, 400 Jay Street. (914) 232-5651; johnjayhomestead.org. KATONAH Katonah Museum of Art “Steve Tobin: Katonah Steelroots.” Through Sept. 19. $3 to $5; members and children under 12, free. Tuesdays through Saturdays, 10 a.m. to 5 p.m.; Sundays, noon to 5 p.m. Katonah Museum of Art, 134 Jay Street.katonahmuseum.org; (914) 232-9555. MAHOPAC Mahopac Public Library “Optimism in a Lonely World: Found Object Assemblage,” works by Jean Tock. Through Jan. 31. Mahopac Public Library, 668 Route 6. (845) 628-2009; mahopaclibrary.org. PEEKSKILL Hudson Valley Center for Contemporary Art “Double Dutch,” group show featuring contemporary Dutch installation and video art. Through July 26. $2 to $5; members, free. Saturdays and Sundays, noon to 6 p.m.; or by appointment. Hudson Valley Center for Contemporary Art, 1701 Main Street. hvcca.com; (914) 788-0100. PEEKSKILL Paramount Center for the Arts “Interiors,” group show, produced by the Flat Iron Gallery. Through Jan. 31. Mondays through Fridays, 10 a.m. to 5 p.m.; Saturdays, 10 a.m. to 3 p.m. Paramount Center for the Arts, 1008 Brown Street. PELHAM Pelham Art Center “Objectified,” contemporary sculpture. Friday through April 17. Opening reception Friday at 6:30 p.m. Free. Tuesdays through Fridays, 10 a.m. to 5 p.m.; Saturdays, noon to 4 p.m. Pelham Art Center, 155 Fifth Avenue.pelhamartcenter.org; (914) 738-2525. POUGHKEEPSIE James W. Palmer Gallery “Teen Visions ’10,” group show. Through Wednesday. Mondays through Fridays, 11 a.m. to 6 p.m.; Sundays, noon to 6 p.m. James W. Palmer Gallery, 124 Raymond Avenue. Poughkeepsie Vassar College, Frances Lehman Loeb Art Center “At the Heart of Progress: Coal, Iron and Steam Since 1750 — Industrial Imagery From the John P. Eckblad Collection.” Through March 21. “Harry Roseman: Hole in the Wall,” installation. Through May 18. Tuesdays, Wednesdays, Fridays and Saturdays, 10 a.m. to 5 p.m.; Thursdays, 10 a.m. to 9 p.m.; Sundays, 1 to 5 p.m. Vassar College, Frances Lehman Loeb Art Center, 124 Raymond Avenue. (845) 437-5632; fllac.vassar.edu. POUND RIDGE Hiram Halle Memorial Library “Thirty-Fifth Annual Ground Glass Photo Exhibition,” works by 20 Westchester-based photographers. Feb. 6 through March 20. Free. Tuesdays and Thursdays, 10 a.m. to 8 p.m.; Wednesdays, Fridays and Saturdays, 10 a.m. to 5 p.m. Hiram Halle Memorial Library, 271 Westchester Avenue. (914) 764-5085;poundridgelibrary.org. PURCHASE Manhattanville College Creative Arts Center “Found on Facebook,” group show. Through Feb. 18. Mondays, Tuesdays, Thursday and Fridays, 11 a.m. to 6 p.m.; Wednesdays, 11 a.m. to 7 p.m.; Saturdays, noon to 4 p.m. Manhattanville College Creative Arts Center, 2900 Purchase Street. mville.edu; (914) 694-2200. PURCHASE Neuberger Museum of Art “Tania Bruguera: On the Political Imaginary,” installations and performance works. Through April 11. Free. Tuesdays through Sundays, noon to 5 p.m. Neuberger Museum of Art, 735 Anderson Hill Road. neuberger.org; (914) 251-6100. RHINEBECK Montgomery Row Second Level “Transitions,” digital photographs and mixed-media collages by Kary Broffman. Through Feb. 27. Mondays, Tuesdays, Thursdays and Fridays, 9 a.m. to 8 p.m.; Wednesdays and Saturdays, 9 a.m. to 6 p.m.; Sundays, 10:30 a.m. to 2:30 p.m. Montgomery Row Second Level, 6422-3 Montgomery Street.montgomeryrow.com; (845) 876-6670. RYE Rye Arts Center “Off the Record: Rock, a Social Revolution,” photographs, vintage posters and memorabilia. Through Feb. 26. Tuesdays through Fridays, 11 a.m. to 5 p.m.; Saturdays, 10 a.m. to 4 p.m. Rye Arts Center, 51 Milton Road. ryeartscenter.org; (914) 967-0700. SHRUB OAK John C. Hart Memorial Library “Naturally Beautiful,” works by Stephen Kivisalu. Through Jan. 31. Mondays through Thursdays, 9:30 a.m. to 8 p.m.; Fridays and Saturdays, 9:30 a.m. to 5 p.m.; Sundays, 1 to 5 p.m. John C. Hart Memorial Library, 1130 East Main Street. yorktownlibrary.org; (914) 245-5262. WEST NYACK Rockland Center for the Arts “Blessings From the Tree of Life: Jennie Chien,” sculpture. “Stage Life: The Photography of Stephanie Berger.”(hilite) “Fresh Paint,” group show. All run through March 7. Mondays through Fridays, 9 a.m. to 5 p.m.; Saturdays and Sundays, 10 a.m. to 4 p.m. Rockland Center for the Arts, 27 South Greenbush Road. rocklandartcenter.org; (845) 358-0877. WOODSTOCK Galerie BMG “Rita Maas: Skylight Views,” photographs. Through Feb. 22. Fridays and Mondays, noon to 5 p.m.; Saturdays and Sundays, 11 a.m. to 6 p.m.; or by appointment. Galerie BMG, 12 Tannery Brook Road. (845) 679-0027; galeriebmg.com. BRIARCLIFF MANOR Choral Arts Society, Scarborough Presbyterian Church “Immortal Beloved,” classical. Jan. 31 at 4 p.m. $20 and $25. Choral Arts Society, Scarborough Presbyterian Church, Route 9. (914) 462-3212; choralartssociety.org. COLD SPRING Hudson House Inn Michelle LeBlanc Duo, jazz. Every Saturday, 7:30 to 10:30 p.m. Through Feb. 27. Free. Hudson House Inn, 2 Main Street. (845) 265-9355;hudsonhouseinn.com. HARRISON The Veterans Memorial Building “The Harrison Players Present Mardi Gras,” dinner, dancing and entertainment featuring the Boomerang Band and New York Performing Arts Center’s Showstoppers, a youth performance group. Feb. 13 at 7 p.m. $15 and $20. The Veterans Memorial Building, 210 Halstead Avenue. harrisonplayers.org; (914) 630-1089. MAMARONECK Emelin Theater Greg Brown, folk and rock. Feb. 13 at 8 p.m. $35. Emelin Theater, 153 Library Lane. (914) 698-0098; emelin.org. MONTROSE The Reformed Church of Cortlandtown “City Called Heaven VII,” choir festival celebrating African-American culture with music and historical readings. Jan. 31 at 3 p.m. Free. The Reformed Church of Cortlandtown, 2124 Albany Post Road. OSSINING Ossining Public Library Leann Nicole Osterkamp, classical piano. Jan. 31 at 3 p.m. Free. Ossining Public Library, 53 Croton Avenue. ossininglibrary.org; (914) 941-2416. POUGHKEEPSIE Bardavon Opera House “The Met Live in HD: Simon Boccanegra,” simulcast of opera by Verdi, featuring Plácido Domingo. Feb. 6 at 1 p.m. $15 to $22. Rufus Wainwright, pop. Feb. 12 at 8 p.m. $35 to $55. Bardavon Opera House, 35 Market Street. (845) 473-2072; bardavon.org. VALHALLA Academic Arts Theater “Step Afrika,” African dance performance featuring kicks, stomps and rhythms. Feb. 6 at 8 p.m. $18 and $20. Academic Arts Theater, 75 Grasslands Road. (914) 606-6262; sunywcc.edu. WHITE PLAINS White Plains Performing Arts Center Calpulli Mexican Dance Company. Jan. 31 at 2 and 5 p.m. $20 and $25. White Plains Performing Arts Center, 11 City Place. (914) 328-1600; wppac.com. YONKERS Yonkers Public Library, Grinton I. Will Branch “A Tribute to Judy Garland,” with Francine Evans and Joel Zelnik. Feb. 6 at 2 p.m. Free. Yonkers Public Library, Grinton I. Will Branch, 1500 Central Park Avenue. (914) 337-1500; ypl.org/grinton. NEW ROCHELLE New Rochelle Public Library “The Search for the Fountain of Youth: The How, Why and Must We of Human Aging,” the library’s inaugural “Science Cafe,” with Dr. Warren Rosenberg, biologist and provost of Iona College. Thursday at 7 p.m. Free. New Rochelle Public Library, 1 Library Plaza. (914) 632-7878; nrpl.org. PEEKSKILL Hudson Valley Center for Contemporary Art “Artist Lecture Series: Fendry Ekel and Folkert de Jong.” Jan. 31, 4 to 6 p.m. Free with museum admission. Hudson Valley Center for Contemporary Art, 1701 Main Street. (914) 788-0100; hvcca.com. POUGHKEEPSIE Vassar College “Darwin Days 2010,” an annual celebration of science and the humanities. This year’s festival will focus on women in science, with dramatic readings and presentations by Vassar faculty and staff. Feb. 12 through April 22. Free. Vassar College, 124 Raymond Avenue. (845) 437-7294; arts.vassar.edu. SCARSDALE Greenburgh Nature Center “Biodiversity Is for Every Resident,” lecture on how to create native gardens that attract and support insects, birds and animal life on any size property. With Darrin Duling, director of the Native Plant Center in Valhalla, and Al Krautter, proprietor of Sprainbrook Nursery. Feb. 10 at 7:30 p.m. Free. Greenburgh Nature Center, 99 Dromore Road. greenburghnaturecenter.org; (914) 723-3470. VALHALLA Fine Arts Gallery, Westchester Community College “The Politics of Verdi,” lecture on how freedom and nationalism influenced Verdi’s operas. Presented by Rosemarie Serrano, professor, and the Italian Club of Westchester Community College. Feb. 10 at 11:15 a.m. Free. Classroom Building 100, Westchester Community College, 75 Grasslands Road. (914) 606-7867; sunywcc.edu/gallery. WHITE PLAINS Arts Exchange “The Things That Carried Them to War,” lecture on the Vietnam War by Marilyn B. Young, professor and historian. Feb. 11 at 7 p.m. Free. Arts Exchange, 31 Mamaroneck Avenue. westarts.com; (914) 428-4220. YONKERS Riverfront Library “Read a Loud,” group readings from “The Things They Carried, a Book by Tim O’Brien on the Vietnam War.” Feb. 6 at 5 p.m. Free. Riverfront Library, 1 Larkin Center. artswestchester.org; (914) 428-4220 x 223. ELMSFORD Westchester Broadway Theater “42nd Street,” musical comedy by Michael Stewart, Mark Bramble, Al Dubin and Harry Warren. Through Feb. 6. $75 for dinner and show. Westchester Broadway Theater, 75 Clearbrook Road. MAMARONECK Emelin Theater “Bronx Kiss: A Celebration of John Patrick Shanley,” short plays presented by the Purchase Repertory Theater. Thursday through Feb. 7. $20. Emelin Theater, 153 Library Lane. emelin.org; (914) 698-0098. PURCHASE Manhattanville College Creative Arts Center “Brigadoon,” by Alan Jay Lerner and Frederick Loewe. Through Jan. 31. $5 and $10. Manhattanville College Creative Arts Center, 2900 Purchase Street. (914) 694-2200; mville.edu. SCARSDALE Bendheim Performing Arts Center “The Gingerbread Lady,” staged reading of a comedy by Neil Simon. Brown bag lunch at noon. Thursday, 10:30 a.m. to 2:30 p.m. $10. Bendheim Performing Arts Center, 999 Wilmot Road. thebendheim.org; (914) 472-3300. Judging from some draft evaluations prepared by the Environmental Protection Agency and General Electric, the plan for dredging the Hudson River for PCBs faces some likely adjustments. The first phase of the cleanup, which ran from May to October of last year, turned up more contamination than expected in some areas, according to drafts released on Thursday. Officials also found a higher rate of recontamination of the river from the dredging itself than envisioned in the initial phase, which involved a six-mile segment of the upper Hudson in Washington County. The E.P.A. cautioned that it is far too early to say how the dredging operation might be modified. The draft evaluations will undergo peer review by a group of independent scientists before they are made final, the agency said. Two factories owned by General Electric discharged PCBs, or polychlorinated biphenyls, for three decades before the toxic chemicals were banned in 1977 as a health threat to people and wildlife. The company has carried out the dredging operations under the supervision of the E.P.A., which has designated nearly 200 miles of the river a contaminated Superfund site. 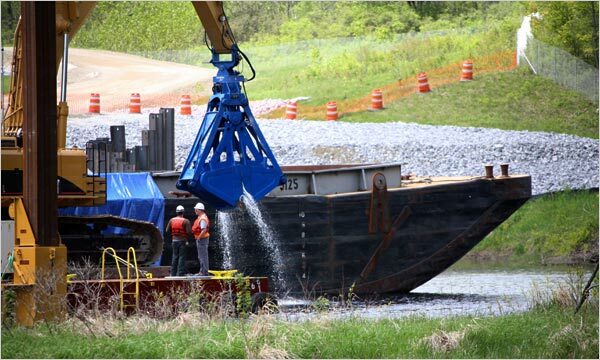 In the second phase, 34 miles of river running to Troy, N.Y., are to be dredged next year. E.P.A. officials said the contamination detected in the first phase was greater than expected in areas where wood debris had collected at the bottom of the river. Walter Mugdan, director of the E.P.A.’s Superfund division for the New York region, said the samples on which its expectations were based were not collected deep enough into the river. All the same, he emphasized that similarly high concentrations of PCBs may not be found elsewhere along the Hudson as the cleanup moves into its second phase. “Whether the same is true as we move further south we don’t know,” Mr. Mugdan said. In its own draft report, G.E. said that the dredging itself released almost 25 times more contaminants into the water than it had anticipated. As a result, it spread previously buried PCBs across the river bottom, leading to a five-fold increase in concentrations of the contaminant in fish, it said. Mark Behan, a spokesman for G.E., said the E.P.A. may have to review the performance and productivity standards established for the dredging to address the issues. He noted that the first phase was intended to be a guidepost for improvements down the line, as this is one of the largest, most complex environmental dredging projects ever attempted. Mr. Mugdan said the agency still expects the second phase to be completed by 2015. On Saturday, February 6th, Eric Nelsen will meet hikers at the Park's Headquarters in Alpine, at 10 AM, to lead them down a trail that marks the continuation of Closter Dock Road, so familiar to today's drivers, and on to the Hudson River to explore what was from Colonial days through the nineteenth century an important river landing and shipping point for the farmers of the area. This hike, will cover about 3 miles in 2 hours, includes some steep slopes as hikers trek from the summit to the river and back and may be challenging to younger participants or non-hikers. The hike, which will be held "drizzle or shine," is free and open to all, with no advanced registration required. New Jersey Section Park Headquarters is on top of the Palisades in Alpine, New Jersey, about 7 miles north of the George Washington Bridge, at the top of Alpine Approach Road (about 1 mile north of Closter Dock Road at Exit 2 of the PIP). Heavy or steady precipitation or icy trail conditions may cause cancellation. If conditions seem questionable on the morning of a hike, participants can call 201 768-1360. Tours of Soprano sites still dominate New York tourism. When The Sopranos first aired in January 1999, nobody could have predicted its phenomenal success. Six seasons and 86 shows later, it was recently voted the best TV show of the previous decade. The final episode aired more than two years ago, but show fans still flock to New York for the Sopranos tour and take in Tony’s favourite mob spots. I joined them for a fascinating trip around New Jersey and New York. As the tour begins we’re treated to a visit from Vito Spatafore, played by Joseph Gannascoli. “You’ll love the tour,” he says, before adding a gangsterish “No-one ever complains”. With that we head off into the Lincoln Tunnel and, with the show’s music ringing in our ears, we go under the Hudson River and into New Jersey, home of Tony Soprano. First stop is at a diner under the Pulaski Skyway where Tony’s protégé, Christopher Moltisanti, was shot in a botched assassination attempt. The tour, operated by On Location Tours (screentours.com; tickets $42, 212-209-3370) finishes at the Satin Dolls club in Lodi, otherwise known to Sopranos viewers as the Bada Bing club. 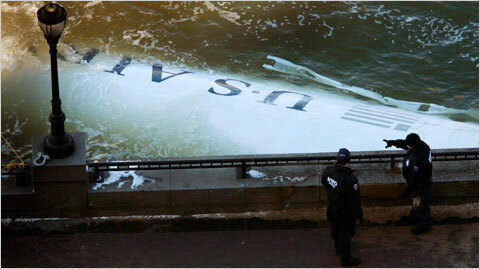 Seth Wenig/Associated PressThe submerged US Airways Airbus 320, after it splashed down on the Hudson River on Jan. 15, 2009. Care to buy a plane? Granted, it can’t fly. And it’s a bit waterlogged. But it has great sentimental value. Shipping and handling fees apply. The US Airways Airbus A320 that splashed down in the Hudson River last January is for sale, put on the online auction block by the insurance companyChartis, a subsidiary of the American International Group. The sale attracted widespread attention within hours on Friday, and Chartis was apparently so inundated by curiosity or online bids that it removed the information from its Web site. Chartis identified the plane only by its registration number and its family name, A320, and yet it was instantly recognizable. Of course, “interest” might be an understatement for the significant object that turned into one of the year’s most captivating and uplifting dramas. All 155 passengers and crew of Flight 1549 emerged safely out of the icy waters of the Hudson River after Captain Chesley B. Sullenberger III and his co-captain, Jeffrey B. Skiles, guided the plane to safety after it struck a flock of birds shortly after takeoff on Jan. 15, 2009. After March 27, the aircraft will be in some lucky person’s possession. But then what? The jet’s engines, which were disabled by the birds in flight, are not part of the sale. In pictures available in Chartis’s original online posting, the tail appears detached. Both wings are detached. Some of the seat cushions, used as flotation devices, appear removed. The cockpit looks intact, but mud cakes the controls. The rear bottom of the plane is heavily damaged, with wires dangling. And the nose cone of the plane is cracked. Still, the fuselage strikes a stunning pose. Where will the plane be housed next? A private hangar? Will it end up at a museum? The Smithsonian Institution’s National Air and Space Museum seems a natural fit. “We don’t buy artifacts,” said Brian Mullen, a spokesman for the museum. But what if someone were to offer the plane, or a part of the plane, as a donation? It’s one thing to store a salvaged Piper aircraft (several are on the auction block), it’s another to haul the 123-foot-long fuselage away on the New Jersey Turnpike on a victory ride. Some great news from the State of New York. A4112, a bill to prohibit commercial fishing for striped bass in the Hudson River – effectively making it a game fish there - has already passed the Assembly. S4948, the Senate version of this bill, is coming up for a hearing before the Environmental Conservation Committee on Feb. 23. The bill is sponsored by Senator Antoine M. Thompson, the Chairman of the committee. The Hudson is the second largest spawning ground for striped bass; keeping it free from the pressures of commercial gill netting is vital to the health of the striper population. We all need to get behind this bill now to make sure it takes effect. If you are a NY State resident you should e-mail or even better, phone, write ande-mail the office of your state senator today and tell him or her that you want their support for S4948, the bill to protect Hudson River striped bass from the pressures of commercial fishing. You should also send a copy of your e-mail or letter to all Senators on the Environmental Conservation committee. If you are not a NY State resident you should still e-mail or write the Senators on the committee and tell them that striped bass spawned in the Hudson are important to the whole coastal fishery, and that they should be protected from commercial harvest. If you fish the Hudson for stripers, especially if you travel to get there, stay in a hotel, or fish with a guide, please be sure to point this out in your communication. The economic benefits are key rationale for this bill. Be aware that a handful of shad gill netters on the Hudson are clamoring to be allowed to net stripers now that the shad are gone. They have their supporters; we must make sure that this additional pressure is not put on the already struggling striped bass population. With the fishing pressure and disease issues that persist in the Chesapeake Bay striper stocks, we can’t allow the Hudson to go back to the commercial striper fishing that nearly wiped it out more than 30 years ago. NY residents, here is a sample letter to copy, paste, and send to your senator. Please feel free to modify it into your own words, and to add whatever additional comments you want. Your letters to senators on the Committee can be essentially the same except for not saying that you live in their district. My name is (your name) and I live in your district in the town of ( your town). The future of striped bass is very important to me. Thirty years ago Hudson River stripers were almost wiped out by commercial fishing pressure. The fishery has been closed to commercial fishing since 1976, and the population has recovered, though breeding age fish are under intense fishing pressure in the ocean. Striped bass support a robust recreational fishery that is very valuable to the economies of the towns from Troy to Manhattan. Senate billS4948 has been referred to the Environmental Conservation Committee. It is very important to me that you support this bill. For those residing outside of NY, here is a sample letter to copy, paste, and send to members of the Environmental Conservation Committee. Please feel free to modify it into your own words, and to add whatever additional comments you want. Please try to send it to every member of the committee. My name is (your name) and I live (town, state). I am writing to urge you to support S4948, the bill to protect Hudson River striped bass from the resumption of commercial fishing. The Hudson River is one of the major spawning areas for the migratory East coast striped bass stock. This is the most important recreational salt water species in America. Like all saltwater species, stripers are already threatened by intense fishing pressure and pollution. Thirty years ago Hudson River stripers were almost wiped out by commercial fishing pressure. This fishery has been closed to commercial harvest since 1976, and the population has recovered, though breeding age fish are under heavy fishing pressure in the ocean. Senate bill S4948 has been referred to the Environmental Conservation Committee. It is very important to me that you support this bill. Note – A copy of S4948 is available under General News on the Stripers Forever website - just Google up Stripers Forever. We are not including a link to try and keep our e-mails from being caught in spam filters. These dramatic photographs show two of the massive tunnels being excavated deep below Grand Central Terminal, as crews grind and blast through Manhattan bedrock to make way for theLong Island Rail Road. The caverns are 150 feet underground — the length of the Statue of Liberty — and contractors are removing enough dirt to fill 13,000 Olympic-sized pools. Inside the West cavern, the world’s largest road-header — a rotating spiked rock pulverizer — is at work forming one of the tunnels. The East cavern — now a perfect circle — will soon get the same treatment. Underneath Grand Central Terminal, where the new East Side Access train tunnel and concourse will be built for the L.I.R.R. New York, NY. Trains from Jamaica, Queens and Port Washington will travel to a new terminal on the East Side of Manhattan for access to the L.I.R.R. Here can be seen part of the main concourse where people will catch the trains. It should be relatively open. Here one of the new train tunnels can be seen. "In about three years, we’ll be laying down the rails," said Andy Thompson, program manager. Tunnel-boring machines have dug through four miles of rock, and about two miles still remain. The result will be tubes that run from East 63rd Street and Second Avenue to East 37th Street and Park Avenue. Beyond 63rd Street, the LIRR trains will run under the East River inside two already-existing tunnels beneath the F subway. The finished platform area will run from about East 48th Street to 44th Street. Service is expected to begin late in 2016, and officials said it will reduce the commute for 180,000 daily riders by about 40 minutes. The $8 billion mega-project is the MTA’s most costly, about $3 billion more than the Second Avenue Subway. It suffered a setback last year when officials said the price increased by $800 million.